The species is almost confined to the coasts of southern England and South Wales, but also recorded from Yaxley and Woodwalton Fens, Huntingdonshire, two old brick pits in the Peterborough area, an old pulverised fly ash (PFA) lagoon site and two other brownfield sites in South Essex. It is widespread and more frequent in Europe. S. venator occurs in sand dunes on the coast, usually low down among marram, and among similar tussocky vegetation in fens. More recently it has been found in two old brick-pits, in one case on a fairly steep bank with Phragmites and partial vegetation cover near the margin of a pool (P. Kirby, pers. comm.) and in traps set in weathered PFA 'dune' with nearby areas of Phragmites and 'fen' vegetation. It has also more recently been beaten from scrub on several occasions (P.R. 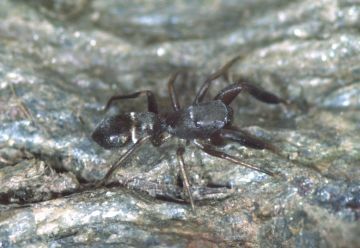 Harvey) and found on a gatepost and post-and-rail fencing (Williams 2005, 2006) The spider is an ant-mimic, usually found in association with ants. Both sexes are adult in summer and autumn, and females also in spring. The spider is fairly common in some large dune systems, but infrequently recorded elsewhere. Public pressure and holiday development on sand dunes, the drainage or growth of scrub in fens. One of the old brick pit sites and the PFA lagoon site have subsequently been developed for housing, and the other brownfield sites have been developed or are under immediate threat of development. Little is needed on sand dunes apart from the reduction of erosion by public pressure. In fens control scrub growth and maintain the water table.